If only this were a mere coincidence. Last year the Centre intensified its combing operation to flush out Maoists from the dense Saranda forests of Jharkhand. By August, following Operation Anaconda, it claimed to have “sanitised” the forests of insurgents. In October the Union Ministry of Rural Development announced a whopping Rs 263 crore development package for 36,000 tribals who traditionally inhabit the forest. Earlier in February, the Centre had renewed and expanded the lease of the Steel Authority of India Ltd (SAIL) to mine iron ore in the forest. The public sector unit is the only company mining inside the forest. Nineteen more projects to mine iron ore in the heart of Saranda are in different phases of approval. Spread over 80,000 hectares in West Singhbhum district, Saranda is the largest sal forest in Asia. It also stands atop one of the world’s largest single deposit of iron ore—over 2,000 million tonnes. At least 36,000 Ho tribals live inside the forest. Most of them collect minor forest produce like sal leaves and seeds to earn a living or are small farmers. 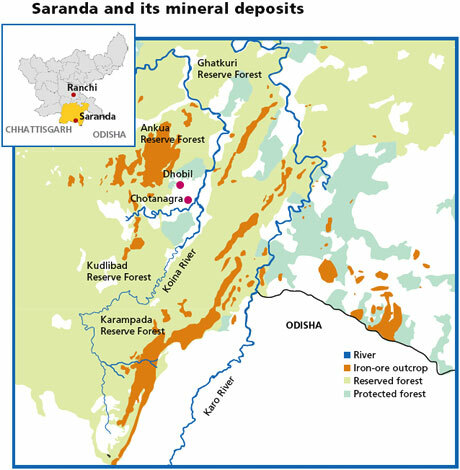 While announcing the Saranda Development Plan as a model for other Maoist-affected areas, Union rural development minister Jairam Ramesh had said, “more mining means more Maoism,” arguing for no private mining in the forests. But Dungdung’s argument is not unfounded. A copy of Saranda Development Plan, which Down To Earth obtained from the forest department, shows 62 per cent of the Rs 263 crore package will be spent on infrastructure development like roads and offices alone. The government has relaxed the restriction to have only unpaved roads inside reserve forests. A network of 130 km of cement-concrete roads will be laid at an expense of Rs 104 crore. The network will be later extended to 250 km. Sushil Barla, district general secretary of the Congress and member of JHRM, says, the Rs 80-lakh-per-km roads are not meant for forest dwellers or department officials to deliver the development programme. One cannot justify such high costs if not for almost a metre deep cement concrete roads required to transport iron ore. Trucks carrying the ore weigh up to 30 tonnes and require heavy duty roads. The next major chunk of the package is for integrated development centers (IDCs)—prefabricated structures to house civil and forest officials who will administer the package. IDCs will be a one-stop-development shop that will provide subsidised ration under the public distribution scheme, generate employment under the Mahatma Gandhi National Rural Employment Guarantee Scheme, and have health centres, forest offices, banks, anganwadi, retail stores, mobile towers and even photo studios. The cost for constructing an IDC is Rs 6 crore. The plan is to set up 10 IDCs to cater to all the 56 Saranda villages. These leave Rs 99 crore for development works like providing housing facilities for people below poverty line, clean drinking water and sanitation, watershed projects, installing handpumps, solar lanterns and setting up schools. Located at the trijunction of Jharkhand, Odisha and Chhattisgarh, Saranda is strategically crucial for Maoists. By the government’s own reckoning, Saranda is the headquarters of the Maoists’ eastern regional bureau. Strategically, it comes next to the Dandakaranya forests of Chhattisgarh, which the Maoists have declared the liberated zone. The forests are also the prime revenue earner for the banned organisation. Dungdung says Maoists earn at least Rs 500 crore per year from Saranda by imposing levies on mining companies. Some offer them protection money to do business in a Maoist bastion, while those mining illegally beyond their lease area pay hefty sums. In 2007-08, Rungta Mines and Usha Martin reportedly paid Rs 25 lakh each to Maoists. Months after the combing operation, the paramilitary forces in March discovered opium fields inside Saranda as another source of their income. Besides, in and around Saranda are doco areas where iron ore can be illegally obtained from river beds and fields. Four people can gather as much as 12 tonnes of ore within three hours, which can be transported to crushers dotting the 140 km road from Rourkela to Barbil in Odisha, running almost parallel to Saranda. The crushers then sell it to legal mines. Maoists collect a share of the booty and detonators from them. According to the Indian Bureau of Mines’ 2010 report, West Singhbhum is the most mined district in Jharkhand, and accounts for almost the entire share of iron ore mined in the state. Already 44 mining leases for iron ore are operational covering an area of 12,374 ha. At present, most mining activity, except in SAIL’s Chiria mine, is concentrated on the periphery of Saranda. 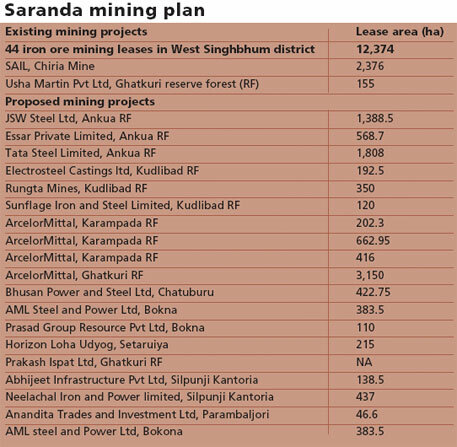 Once the 19 mining projects, which are in different stages of approval, are given the go-ahead, an additional 11,000 ha, or more than one-seventh of the Saranda, will be opened up for mining (see: map and table). Besides, the government is setting up 21 paramilitary camps across the forest, 17 of which have received forest clearance. Add to these the concrete roads, IDCs and ancillary developments for mining. There is no assessment of the gross impact of these developments on Saranda and its dwellers. “It’s genocide of the adivasis,” says Dias. Saranda is to eastern India what the Amazon rainforests are to the world. Its springs feed rivers like the Karo, the Baitarani and the Sanjay that flow through Odisha. With mining these perennial streams are dying. Wastewater from washaries of iron ore mines on the periphery have already contaminated the groundwater aquifers. Mine workers and residents in the periphery of Saranda are dying due to liver diseases caused by contaminated groundwater, while companies blame it on alcoholism. The average life expectancy has plummeted to 45 years in Noamundi where the Tata Iron and Steel Company Ltd operates its mines, Dias adds. Since announcing the Saranda Development Plan, Union rural development minister Jairam Ramesh visited the forest twice to oversee its implementation. On December 2, he visited Chotanagra village, one of the gateways to the interiors of Saranda, with truckloads of goodies—bicycles, transistor radios and solar lanterns. “Some of them were distributed and the rest remains locked in the block office,” says Bhimsen Gop, the village postmaster. “Those who got the cycles spent Rs 200 to fix the missing parts. But that is not an issue. The problem is we are never heard by the government or mining companies. What use are development programme or CSR freebies when our land is turning barren and perennial streams are drying up?” he asks. A visit to Dhobil reveals Gop’s concerns. Dhobil is located next to SAIL’s Chiria mine, one of the country’s oldest iron ore mines operating since 1936, and has borne the maximum brunt of mining. Extending from Chotanagra to Dhobil, Chiria covers almost 3 per cent of Saranda. 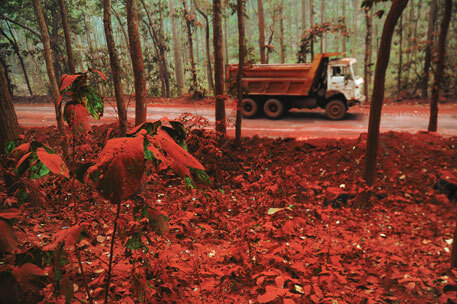 Every monsoon, the sludge and mining waste flows into the agricultural fields, covering it with red mud. 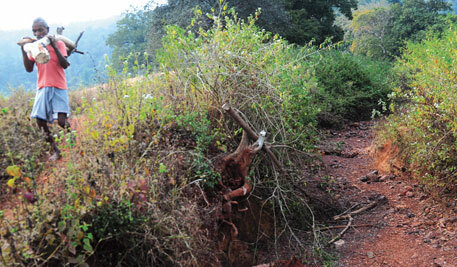 Residents say more than 25 ha in the village are lying barren. One perennial stream has dried up on a five-kilometre stretch. During monsoon it carries water laden with iron ore. The public hearing for expanding the lease area of SAIL was done in Chiria village, some 15 km from Dhobil. The public hearing for ArcelorMittal’s proposed mining project in Karampada forest was held 22 km away in Kiriburu village. So did the hearings for Rungta Mines and Electrosteel Castings. They successfully held their public hearings in Chotanagra, some 30 km from Ushariya village. The village in the heart of Saranda will be directly affected by the mining of Kudliba hills. Jaunga Banda, a part time labourer at Chiria mine was among the few from from Ushariya who took the pain of attending the public hearing. “I could not comprehend what was going on. I just hope that they leave some forests for our graves,” he says. Among the Ho it is customary to give burials in a corner of the village under the shade of trees. Traditionally, sasandiris (burial stones) are their land titles. None of the villages surrounding the proposed mines will be displaced but the forests will disappear. Analysts say the mining leases inside Saranda are in violation of the Fifth Schedule of the Indian Constitution that protects the rights of tribals like the Ho. The Fifth Schedule requires the government to consult and seek the advice of Tribal Advisory Council (TAC) on matters of general welfare and transfer of land, says Stan Swamy of the civil society group Bagaicha. But the government never sought the advice of TAC. Likewise, under the Panchayat Extension to Scheduled Area’s Act (PESA) of 1996, it should have consulted the gram sabha before granting mining leases. But the state government is yet to implement PESA. So far the argument given by the Jharkhand government was that the state did not hold panchayat elections and therefore the Act is not applicable. But the excuse does not hold anymore after the state had its first panchayat elections in 2011, Swamy adds. Devendra Nath Champia, member the state legislative assembly for two decades, a Ho himself, says time is ripe to implement the 1997 Samata Judgement of the Supreme Court, whereby transfer of tribal land to corporations without the consent of the community is deemed null and void. The Ho are known for their historic struggles. Following their revolt against the British occupation of their territory, in 1836-37, the British formed the Kolhan estate, now covering the expanse in and around Saranda, and recognised their customary community rights to the forests, rivers, hills and cultivable land. They recognised the traditional Munda-Manki system of the village headman who has policing powers and rights to settle land disputes. In the late 19th century, the Ho joined the struggle led by Birsa Munda against the feudal agrarian system promoted by the British. Sanjay Basu Mallick, forest rights activist and historian, says in 1978 the Ho fought the forest department as it replaced vast swathes of sal forests with commercial teak plantation and to restore their customary rights to minor forest produce. In 1981 they pleaded before the Commonwealth for complete autonomy from the Indian government. They even resisted for long the panchayat elections arguing their traditional system of governance is superior. But today, an eerie silence hangs over these villages. To protest would be at the risk of being called a Maoist. the environment distruction of mining is never presented in mainstream media.all over what is presented is; it is a natural resource that has to be mined.it never presented to commmon public that to mine these so callled resources brings ecological catastrope to the local area,so the world.it destroys every natural things that is endowed to our earth;air,water,land,forest. Thanks Abhinav for your comment. I feel the very phrase natural 'resource' is distorted- implying its something that ought to be exploited. We seldom use the phrase natural 'wealth' that carries with it the onus of preserving it for the future generation. Being the home minister in charge of counter insurgency operations in mineral rich areas his advocacy is better suited to the ministry of mines. Reminds me of a scene from the film Peepli Live where the agriculture minister argues for industry as the way forward! As far as policymakers go, its an ardous task to make them understand the dangers of exploiting all our natural resources. On the flip side, they do have a tough task at hand. I mean, we city dwellers consume enourmous amount of energy, therefore coal needs to be mined, iron for construction industry, aluminium for fancy windows and aviation. There is a need to go back to Gandhi: 'there is enough in this world for everyone's need, but not for everyone's greed.' Tough choices for us, consumers, for we will blame the policymakers if the resource flow dries out, that is if steel or aluminium prices go up or power cuts become regular. On the lobbying part, India has seen numerous ground struggles. 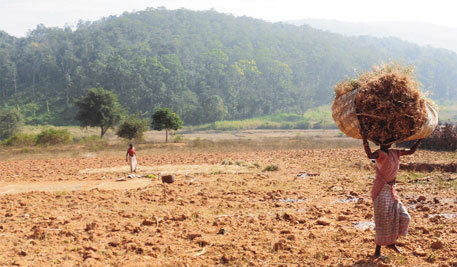 The sheer grit of ordinary people of Niyamgiri and Jagatsinghpur has put on hold big projects like Vedanta and Posco. These struggles also saw participation and guidance from civil society, which is at its robust best. Else our prime minister would not see a red herring (on the Kudankulam case) and raise the bogey of foreign funding, while the home ministry is preparing a civil society blacklist. Saranda and it's forest area is close to the Sundargarh district of Odisha and there are a elephant corridor linked to Odisha. Mining at this area will increase the human-elephant conflict in both state. Great reporting, I must say ! When we look to America for progressive reforms, we should also see what they have done to the Red Indians. we are aping at the west anyway. Nature will ultimately take its toll. There wont be anything left for anybody. It is afterall Kaliyug. Real social growth, need based growth and greed based growth are the era of Indian economy. The different breeds I.e. are in diff. Phases of this growth story. Just imagine--- n think......... why is the need of aboriginals in Saran a n the purpose of huge natural deposit. Can this be overshadowed by the wooing iron ore market. Can't the aboriginals left in their status quo. Or they be given heaven in the human developed forests n this place be mined. What is the view of anthopologists?? the loss of flora n fauna---- can ever be mitigated... ????? I wake up listening to churpin sounds of angel bird. Can Mr. Jairam Ramesh put magic stick for a balance. I would vote for debate on this n an amicable plan is made for future of Saran a. In Gujarat, one activisit who unearthed the link of nexus between Mafia was removed in front of Gujarat High Court Premises by assailants. Unless transparancy in Mining Resources is monitored by an Ombudsman Authority, resources can not be really 'exploited' for nation and proper benefits to co-habitants can not be experienced. Wouldn't the Chotanagpur Tenancy Act, which restricts sale of Adivasi land, apply in Saranda? It is well known & understood by the villagers that what ever plans are made for the development ,the plans are only focused for development for mining giants for encouraging & facilitating their mining activities. Before every public hearing the village leaders are well bribed by the officials and csr activities are announcecd just like a lolipop to them . No practical training & educational facility are provided for the peoples as to make remain them merely a labour. The education system provided by the companies are not upto standard.One should ask them will you let your child to study in the schools promoted by you?.